Israel Putnam is perhaps known best for his role as an American general during the Revolutionary War. 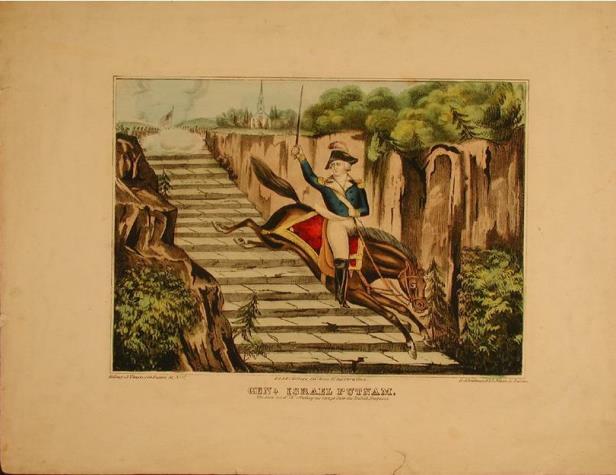 The courage, leadership, and perseverance that endeared him to those of his cause, however, were qualities Putnam displayed long before the war, both in his youthful trailblazing exploits in Connecticut and his service as a colonial militiaman and ranger during the Seven Years’ War. Recognized as a Connecticut hero, Putnam was born into an influential Massachusetts family in Salem Village, now known as the town of Danvers. Rather than settling into the comfortable life afforded him by his father’s inheritance, Putnam decided to strike out on his own, in what was then the wilderness of Connecticut. After purchasing a plot of uncultivated land from Massachusetts Governor Jonathan Belcher, a recently married Putnam and his 18-year-old bride, Hannah Pope, ventured about 75 miles south to start a new life in Connecticut. In the years that followed, the young Putnam quickly gained a reputation for resilience, building a comfortable new residence for his rapidly growing family and expanding his holdings through the arduous labors associated with farming and raising livestock. Putnam’s determination might best be conveyed in an anecdote from the winter of 1742–43 that first made its rounds among his farming peers and later lent itself to embellishment and inclusion in a number of popular 19th-century histories and biographies, including Samuel Goodrich’s Peter Parley children’s series. In the story (eventually referred to as “Putnam and the wolf”), the title character and five of his neighbors went on a hunt for a she-wolf that preyed on their domestic animals. 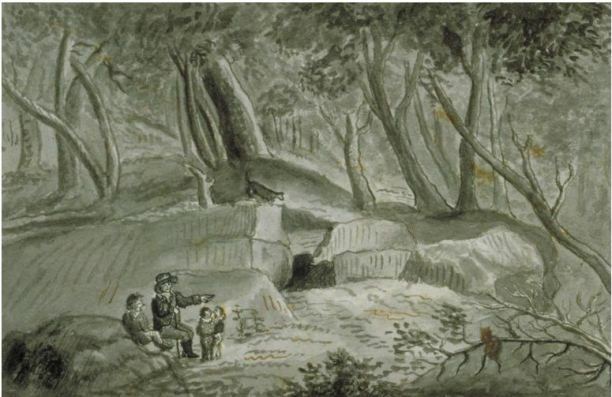 Tracking the animal to its den in a hollowed cave, the men tried various tactics (such as smoke and musket shots) to draw her out. After contemplating whether his broad frame fit through the narrow entry, Putnam agreed to enter the cave, armed only with a makeshift torch and a rope around his foot enabling his comrades to pull him out in the event the wolf attacked. Crawling deep into the cavern, approximated at no more than three feet wide and two feet high, Putnam found the agitated wolf and then quickly signaled his neighbors to pull him out. After assessing the situation, he reentered the cavern with his musket and killed the animal with one shot. The resounding courage and heartiness displayed by Putnam proved indicative of not only the qualities that brought him success as a farmer, but also those that led him to military renown. In the summer of 1755, as the turmoil between France and Great Britain began to intensify among each side’s allies and colonial possessions in North America, Putnam enlisted as a private in the first of the Connecticut regiments raised to assist in a military campaign against the French at Crown Point in New York. By the fall of that year, after earning distinction for his heroics at the Battle of Lake George, the legendary Robert Rogers recruited Putnam to serve as a ranger and scout. Serving in this capacity until 1758, Putnam saw action in a number of campaigns, including General James Abercromby’s ill-fated assault on Fort Ticonderoga in July of that year. In one raid, France’s Iroquois allies captured Putnam and nearly burned him alive before the intervention of a French officer saved him. As a prisoner of war, Putnam traveled to Montreal, and later Quebec, before the French eventually ransomed him. Upon returning to his Pomfret home in the winter of 1758, Putnam found that tales of his exploits in both colonial and English periodicals earned him a measure of international celebrity. By the eve of the Revolution, Putnam, now remarried after the death of his wife Hannah in 1765, had settled back into life as a farmer and tavern owner. Displaying disdain for British colonial policy following the Seven Years’ War, he embraced news of the skirmishes at Lexington and Concord in April 1775, and soon offered his services to the fledgling patriot cause. 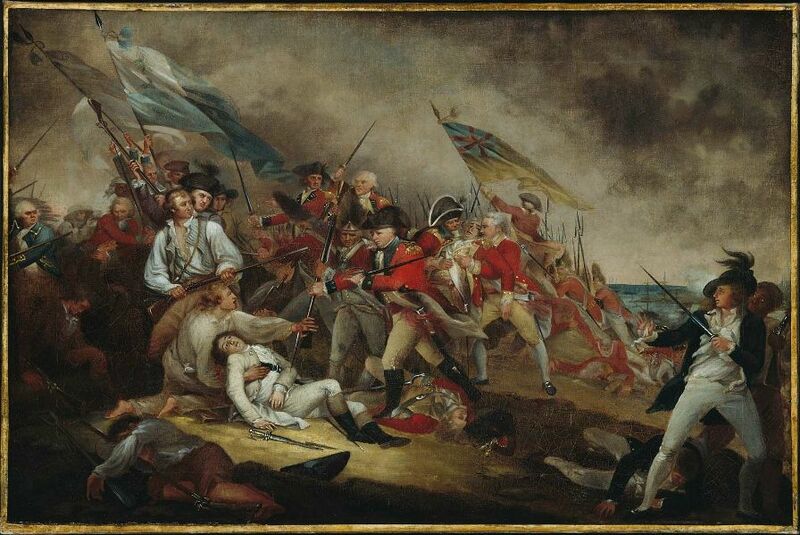 His first major engagement in the Revolution came at the Battle of Bunker Hill, where he played a central role in aligning patriot forces and ensuring order and calm among the men as they fought the superior forces of General William Howe. In the heat of the fray, Putnam (or one of his associates) purportedly delivered the now famous order for patriots not to shoot until seeing the “whites of their eyes,” so as to make the best use of the little ammunition available. 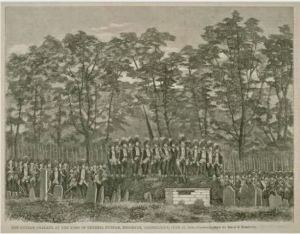 Following the Battle of Bunker Hill, General Washington awarded Putnam the commission of Major General. Congress supported the decision, recognizing Putnam as an indispensable leader who held the army together in its infancy. The image of “Old Put” (as some called him) riding along the lines at Bunker Hill with sword drawn, unperturbed by the dangers around him, embodied the growing belief in the colonials’ ability to fight successfully against British regulars. 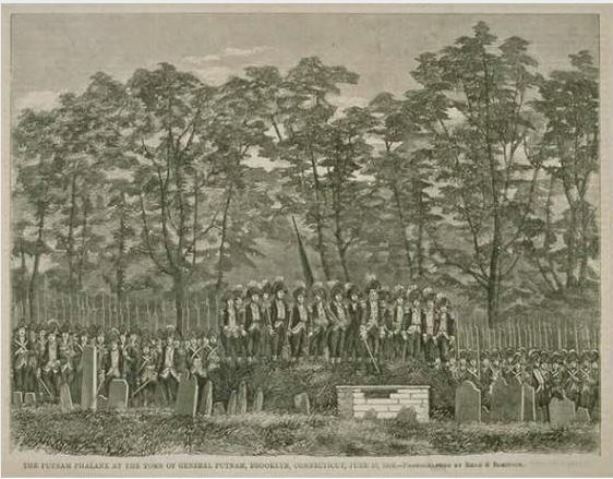 Although the effort ended in defeat, the early heroics of Putnam at Bunker Hill proved to be his crowning achievement in the Revolutionary War. Authorities later called his leadership and tactical abilities into question following his forced retreat at the Battle of Long Island in 1776, and a subsequently unsuccessful campaign in the New York Highlands. In the winter of 1779, while home on military leave, Putnam suffered a stroke, leaving him partially paralyzed and effectively ending his military career. Patrick J. Mahoney is an adjunct professor in the history department at Sacred Heart University. He also writes the Hartford Historic Places column for Examiner.com. “Brooklyn Historical Society,” 2016. Link. “General Israel Putnam Cottage (Knapp’s Tavern),” 2016. Link. “Mashamoquet Brook State Park.” Department of Energy & Environmental Protection, 2016. Link. “Putnam Memorial State Park,” 2016. Link. “Catalog Record of the Israel Putnam Journal and Orderly Book, 1762-1778.” Connecticut Historical Society Library Catalog, 2013. Link. Washington, George. “George Washington to Israel Putnam, et Al, Circular Letter to Officers on Winter Cantonment,” October 14, 1778. Library of Congress, American Memory, George Washington Papers: Series 4. General Correspondence. 1697-1799. Link. New York State Historical Association. Meeting. “Letter of Israel Putnam.” In Proceedings of the New York State Historical Association: The Seventh Annual Meeting, with Constitution, By-Laws and List of Members. New York: New York State Historical Association, 1906. Link. Niven, John. Connecticut Hero, Israel Putnam. Hartford, CT: American Revolution Bicentennial Commission of Connecticut, 1977. Livingston, William Farrand. Israel Putnam; Pioneer, Ranger, and Major-General, 1718-1790. New York; London: G.P. Putnam’s Sons, 1901. Link. Cutter, William. The Life of Israel Putnam, Major-General in the Army of the American Revolution. New York, NY: George F. Cooledge & Brother, 1848. Link.